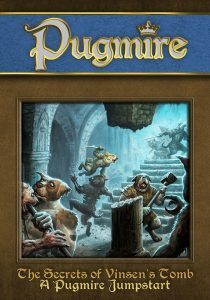 Elements of The Secret of Vinsen’s Tomb came from a playtest adventure from way back when I started designing Pugmire (particularly, the tomb itself). When I rewrote it for the jumpstart, my goal was to showcase to potential Pugmire players how each of they key systems worked. But that’s also all-around good adventure design. I went for at least one roleplay or intrigue scene, one interesting combat or action scene, and one exploration or investigation scene. There’s actually a couple of each of those, and they’re not balanced (for example, there’s some overlap in “combat” and “exploration”). But if you have at least one of each, that’s a good start. Next, don’t be afraid to push the boundaries. A lot of players have remarked that Pugmire has a lot of “white space,” areas of the game world that aren’t detailed or explained. That’s absolutely intentional! The whole concept of Vinsen Pug having a secret tomb was largely just so I could write this adventure. And the adventure itself leaves more open space, leaving open the question of why a demon wants to destroy Vinsen’s sword and shield. In the same vein, don’t be afraid to use loose threads for future adventures — Derry Lurcher’s story comes from the existence of Rondo Border-Collie (another demon-possessed mercenary), and while they don’t directly connect, there’s clearly some elements in common between the characters. How did the player characters get to this scene? What do the player characters need to accomplish in this scene? Who or what is keeping them from accomplishing it? What scene or scenes should logically happen next? Related to that, one tip I try to give to each of my adventure writers: Make sure the players have something to do in a scene! If the whole point of a scene is for the characters to show up, hear something from the Guide, and move on, that’s not very exciting. Let the players make a hard decision, roll some dice, or get into some action. If nothing’s happening, it may be that what you think is a “scene” is actually part of a later scene where something actually does happen.